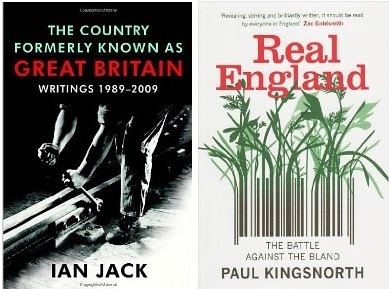 Both these books observe how Britain has changed during the last half century. Paul Kingsnorth is concerned about the march of corporate consumerism and how it replaces all things distinctive and different with things uniform and meaningless, be they shops, town centres, pubs, canals, farms, orchards, the countryside or communities. He rejects accusations of nostalgia or being anti-progress. His concerns are about the replacement of the good with the not-so-good, and the loss of value and our identities. Ian Jack is one of the writers I would like to be. His collection of long and short pieces also compares then with now, evocatively merging fact with personal experience. I was especially moved by his analyses of the ideological changes that led to the Hatfield rail crash, the changes to Dunfermline high street, and the demise of the cinemas in Farnworth, Lancashire. There seems little risk of Ian Jack losing his identity - he maintains it through his writing - but in the end he exemplifies Kingsnorth's concerns.